The 5th ASMA India Study Trends 2018 (ASMA 2018) is distinct from the ASMA Report 2017 on many levels. This year we’ve expanded the scope of research categories further. In addition to the categories of Strategy, Learning & Pedagogy, Alumni Relations and Corporate Relations and Students Life cycle to share the latest in how digital influence the vast canvas of academia. Additionally, we have tried to take a sneak peek into the future role of digital media in academia. 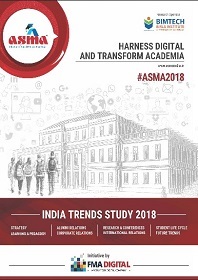 An intensive mapping of the social media and digital technologies in universities and social media, focusing on two important verticals of higher education covering B-Schools and engineering Institutes in India. 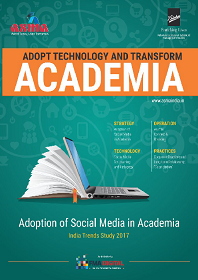 It is also capitalized with new dynamic of social media and online learning with a sustainable model of adopting social media in Higher Education. 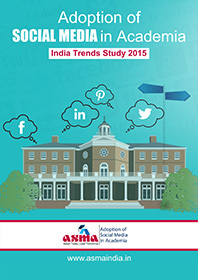 The report includes key potential social media reach in an in-depth analysis of the survey results to comprehend where the institutes are lying in comparison to other institutes, the best practices which are followed, articles on adoption of social media, success stories , study on student-institute touch points framework to devise strategy and also valuable recommendations that helped institutes in getting a rationale behind their social media strategy. 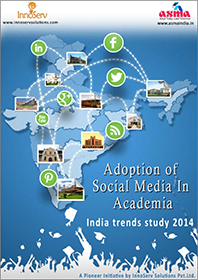 It attempts to showcase the social media adoption in Academia. The report is based on an extensive study conducted in which business schools with diverse attributes from the country participated. 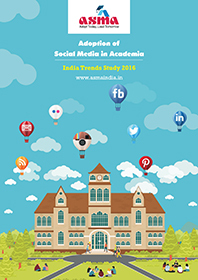 Highlights of the report include best practices followed by institutes, in-depth analysis of the survey results to comprehend where your institute is lying in comparison to the other institutes, articles on social media adoption, and also valuable recommendations that will help institutes in getting a rationale behind their social media strategy.